The Russian Orthodox Church is Catholic but not affiliated with the Roman Catholic Church. Orthodoxy is the original Catholic church founded by the Apostles long before there was a split which put the Roman Catholic Church in the West and the Eastern Catholic (Orthodox) churches in the East. (Wikipedia): It is traditionally believed that the Russian Orthodox Church was founded by the Apostle Andrew, who is thought to have visited Scythia and Greek colonies along the northern coast of the Black Sea. According to one account, Andrew reached the future location of Kiev and foretold the foundation of a great Christian city. The spot where he reportedly erected a cross is now marked by St. Andrew’s Church in Kyiv (Kiev). By the middle of the 10th century, there was already a Christian community among Kievan nobility, under the leadership of Greek and Byzantine priests, although paganism remained the dominant religion. Princess Olga of Kiev was the first ruler of Kievan Rus to convert to Christianity, either in 945 or 957. Her grandson, Vladimir the Great, made Kievan Rus’ a Christian state. As a result of the Christianization of Kievan Rus’ in 988, Prince Vladimir I of Kiev officially adopted Byzantine Rite Christianity — the religion of the Eastern Roman Empire — as the state religion of Kievan Rus’. This date is often considered the official birthday of the Russian Orthodox Church. Thus, in 1988, the Church celebrated its millennial anniversary. It therefore traces its apostolic succession through the Patriarch of Constantinople. Today the Russian Orthodox Church, with over 145 million followers, is the largest of all the Orthodox bodies by far. The Russian Orthodox Church (ROC); or The Moscow Patriarchate (Russian: Русская Православная Церковь (Russkaya Pravoslavnaya Tserkov), or Московский Патриархат , is a body of Christians who constitute an autocephalous Eastern Orthodox Church under the jurisdiction of the Patriarch of Moscow, in communion with the other Eastern Orthodox Churches. Orthodoxy in Russia in the late 2000’s is growing at a rate in which church leaders are finding difficult to manage. Most encouraging is the number of believers under the age of 30 who are swelling the ranks of professing Orthodox Christianity. The process of becoming a monk or nun is intentionally slow, as the vows taken are considered to entail a life-long commitment to God, and are not to be entered into lightly. After completing the novitiate, there are three ranks within monasticism. There is only one monastic habit in the Orthodox Church (with certain slight regional variations), and it is the same for both monks and nuns. Each successive grade is given a portion of the habit, the full habit being worn only by those in the highest grade, known for that reason as the “Great Schema,” or “Great Habit.” One is free to enter any monastery of one’s choice; but after being accepted by the abbot (or abbess) and making vows, one may not move from place to place without the blessing of one’s ecclesiastical superior. Orthodox monks are addressed as “Father” even if they are not priests; but when conversing among themselves, monks will often address one another as “Brother.” Novices are always referred to as “Brother.” Among the Greeks, old monks are often called Gheronda, or “Elder”, out of respect for their dedication. In the Slavic tradition, the title of Elder (Slavonic: Starets) is normally reserved for those who are of an advanced spiritual life, and who serve a guide to others. Nuns who have been tonsured to the Stavrophore or higher rank are addressed as “Mother”. Novice and Rassophore nuns are addressed as “Sister”. Nuns live identical ascetic lives to their male counterparts and are therefore also called monachai (the feminine plural of monachos), and their community is likewise called a monastery. When the last of Napoleon’s soldiers left Moscow, Tsar Alexander I signed a manifest, 25 December 1812, declaring his intention to build a Cathedral in honor of Christ the Saviour “to signify Our gratitude to Divine Providence for saving Russia from the doom that overshadowed Her” and as a memorial to the sacrifices of the Russian people. After the Revolution and, more specifically, the death of Lenin, the prominent site of the cathedral was chosen by the Soviets as the site for a monument to socialism known as the Palace of Soviets. On 5 December 1931, by order of dictator Josef Stalin the Cathedral of Christ the Saviour was dynamited and reduced to rubble. It took more than one blast to destroy the church and more than a year to clear the debris from the site. Instead of building a palace, funds for the largest building in the world remained unavailable, and finally under Nikita Khrushchev it was transformed into a huge public swimming pool. With the end of the Soviet rule, the Russian Orthodox Church received permission to rebuild the Cathedral of Christ the Saviour in February 1990. A temporary cornerstone was laid by the end of the year. The restoration was commissioned to restore the Cathedral to its original specifications. A construction fund was initiated in 1992 and funds began to pour in from ordinary citizens by the autumn of 1994. Christ the Savior Cathedral is the largest Orthodox Church in the world with multiple chapels and the ability to hold over 7,000 people at the same time. Hello – beautiful photographs and wonderfully informative post. I will be visiting Russia for the first time next month. My sister and I will be going on a 13 day Viking Kirov cruise from St Petersburg to Moscow. 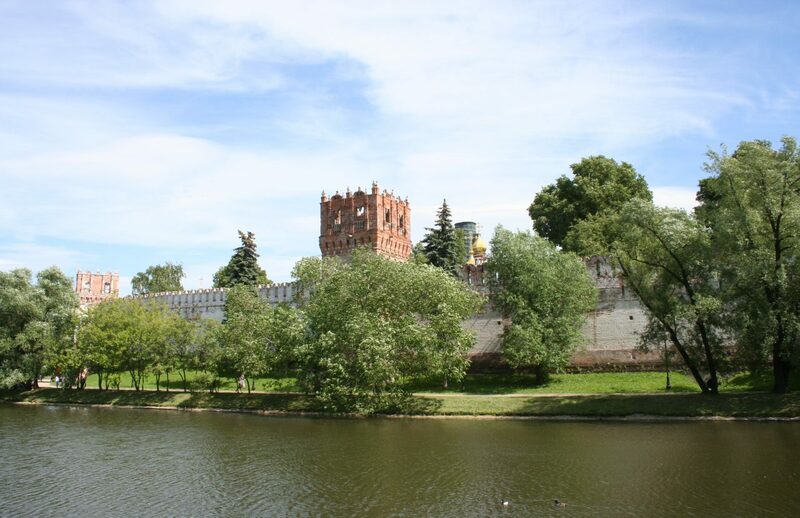 I am particularly interested in finding anything connected with St James the Greater (aka St Jacques/San Tiago.St Jakob, St Jacobus) in Russia. Have you any idea if there is any evidence of old pilgrimage routes from Russia or any St James’ churches, scallop shells or such in Russia?